FrieslandCampina provides people around the world with all the good things milk has to offer. We are a unique multinational FMCG & B2B company aiming to stay successful in an ever changing and increasingly complex world. We are unique because our suppliers, the farmers, are also our shareholders. Since we own the entire supply chain from grass to glass we guarantee high quality of all our products. At FrieslandCampina you can own your career and act accordingly, while making a difference in your job. We offer the perfect environment to have an impact. We have a trainee program in place for the following disciplines: Finance, Supply Chain/Operations, Commercial, Technology, Business & IT and HR. The traineeship program of two years consists of two assignments where you will fulfill challenging jobs with a lot of responsibilities and/or projects. Next to the assignments we have a training and development program in place and are several trainee events organized. 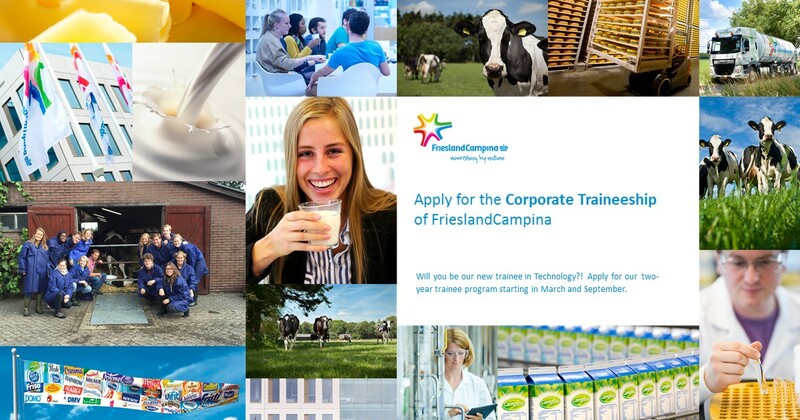 Check regularly our website for up to date information www.careersatfrieslandcampina.com, for questions send an email to traineeship@frieslandcampina.com.